Spring trolling in Simrishamn seems to be the best in many years, the boats tha have been out have on average gained more than 2 salmon several of which just over 10 kg! When fishing in the Blekinge archipelago we leave port at Gyön near Järnavik, Tjärö and Svalemåla Holiday Village. In Blekinge archipelago, there is a very interesting fishing, primarily for pike. It is a paradise for pike fishing and fishermen from all over Sweden come here for the waters off Eriksberg which is renowned for its big pike. The cod has increased in numbers is a fun to fish when the bite often. We use all of pilkning which makes it completely inexperienced running quickly. For the family, I recommend a relaxing trip for the excellent Baltic cod. About Sport fishing is perhaps Sweden's most widespread hobby, and with the right tricks, you catch more and bigger fish. 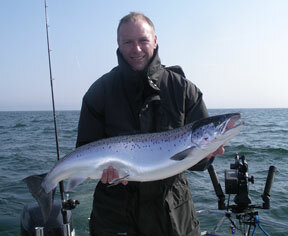 Experience a thrilling sea fishing in a stunning setting with wonderful scenery. With top equipment and experienced guides give you a full day of some of Sweden's best fishing grounds. You start in the morning and start the day with the review of today's fishing. A little theory on fishing in Sweden and robust trick for best results. You can borrow all the necessary fishing equipment and clothing needed. Your guide takes you, then out to sea to the best fishing grounds for the day. The boat is fully equipped and specially adapted for sea fishing. During the day, served more easily swallowed. Please include camera to immortalize the day's catch. You fish all day and be back before evening. The price includes all fishing equipment needed for the day, including a lifejacket. It also includes coffee, soft drinks and snacks. Lunch can be arranged. Cash payment before we leave the pier for private individuals.